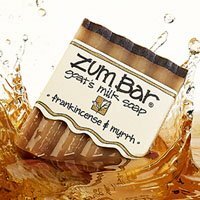 Zum organic Goat Milk Soaps, Lotions and more by Indigo Wild | P.C. Fallon Co.
Zum Soap and other Indigo Wild products presented by P.C. Fallon. Wildly fragrant and natural Zum soaps, lotions, balms, and candles are made with unique ingredients such as: goat's milk, soy wax, jojoba oil, shea butter, argan oil, and dragon’s blood. Essential oils are used to give each Zum product its uniquely appealing scent. Man, this stuff smells good!